At the top of the world Amidst the grandeur of the Blue Ridge Mountains, Where the air is fragrant and fresh, Natural springs cascade through an ancient hardwood forest And life is tempered with the genteel charm And rich traditions of the Carolinas. This is Mountaintop Golf & Lake Club The perfect private mountain retreat Designed to embrace your family for generations. A world-class spa and state-of-the-art wellness center To pamper your body, mind and spirit. 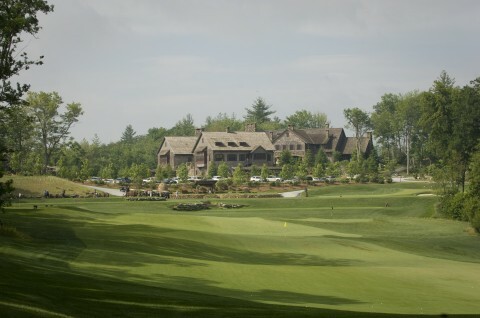 An inspired golf course, Masterfully crafted by Tom Fazio. A private Lake Lodge on the shores of Picturesque Lake Glenville. Giving you convenient and comfortable access to a host of summertime family recreation, Inviting outdoor adventures and wilderness experiences. Including backcountry hiking trails, horsepacking, flyfishing, White water rafting, and luxury overnight camping. At Mountaintop, the choices are limitless the experiences unmatched. The Mission at Mountaintop is to enrich the lives of the Mountaintop Family Through a genuine desire to create memorable experiences that last a lifetime. Housing just 251 estate lots with 75 Adirondack inspired-cabins and lodges peppered about the property, Mountaintop Golf & Lake Club brings new meaning to the term exclusive. Lots range in size from one-half acre to five acres, providing residents with the peace and quiet that has become a trademark of luxury mountain living. Mountaintop is also highly revered for its supreme level of service available to club members through the added benefits of property management and lifestyle concierge services. And lets not forget the views! At such a high elevation, the vistas at Mountaintop are truly unsurpassed. Nestled between the resort town of Highlands and the historic village of Cashiers, Mountaintop residents are afforded easy access to the wonderful shops, fine dining and unique culture of these two popular vacation destinations. Silver Creek Real Estate Group is proud to representincredible properties in this incomparable development.For more information abouthomes and lots forsale or to schedule a tour of this distinctive community high atop the mountains of Western North Carolina, call one of our experienced brokers at 828.743,1999, e-mail us at info@ncliving.com or drop by Silver Creeks offices, conveniently located in the heart of Cashiers in The Shoppes at CreekSide. To view homes for sale in Mountaintop, click HERE. To viewlots for sale in Mountaintop, click HERE. If you are considering selling your Mountaintop home,we encourages you to give us call right away in order to capitalize on the upcomingseason.